I’ve been eating a lot of sushi lately because if i’m leaving Vancouver…I have a bucket list and I have to get through the list before we leave. This basically means, I plan on eating my way through the lower mainland over the next few months. I apologize if I won’t be blogging as much or creating new dishes…but I will confess now, it’s probably because I am eating everyone else’s food!! The inspiration for this dish really comes from all of the delicious sushi restaurants in the lower mainland and a little dish I just can’t get enough of…Gomae. If you haven’t had it, it’s so flippin good. It’s fresh and light and such a perfect side to any sushi roll. 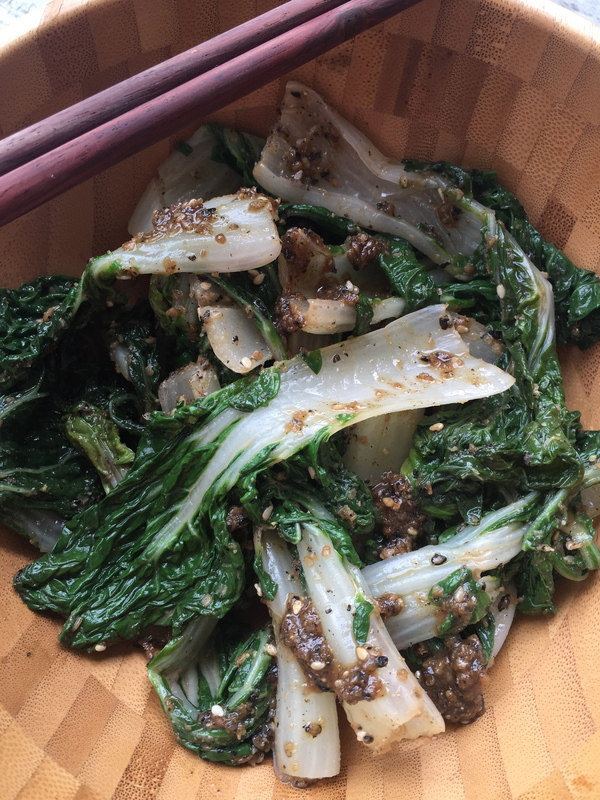 Its traditionally made with steamed spinach and is served cold but today, i’m going to put my own twist on this and i’m going to use Baby Bok Choy. (Also because I had a whole big bag of it in my fridge and I had to do something with it). 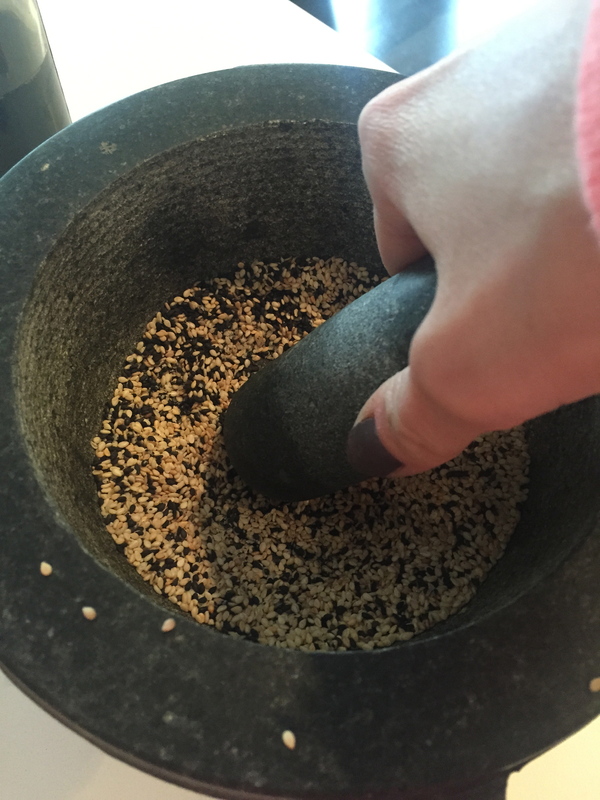 Time to get out the good ole mortar and pestle for this one! 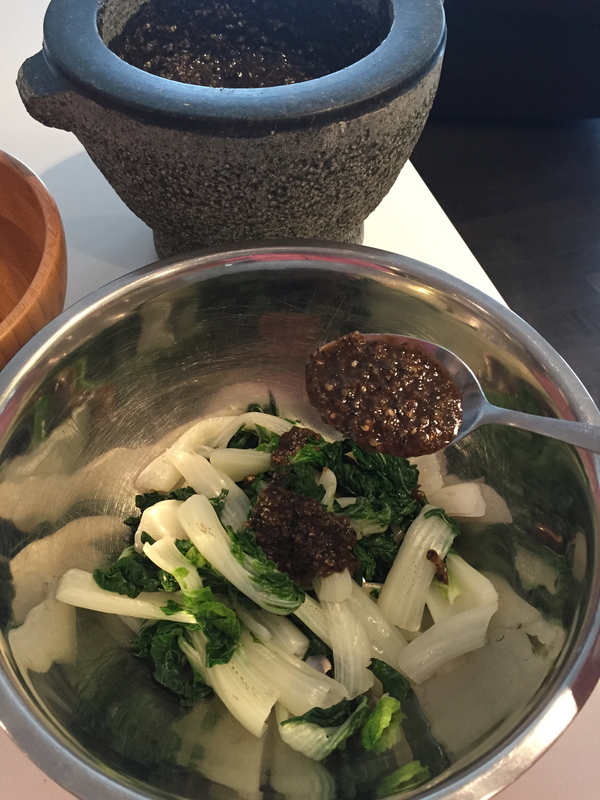 Basically you are going to make your gomae dressing which really only takes a minute. 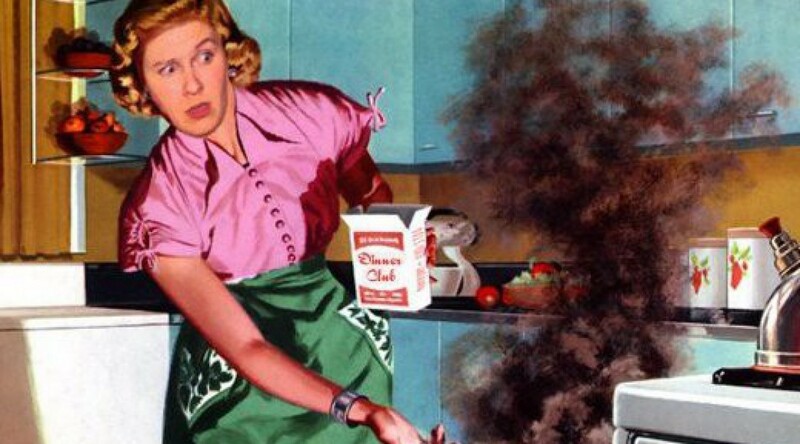 You start by pounding the heck out of some roasted sesame seeds. 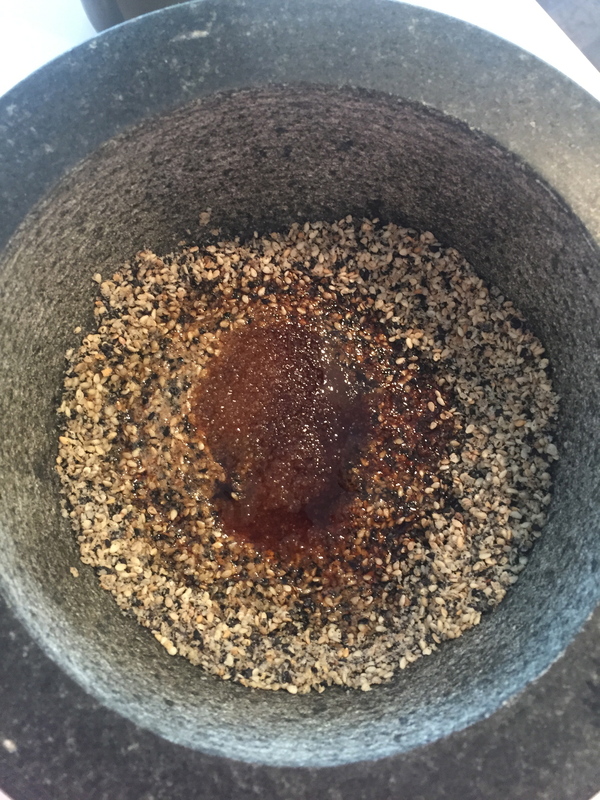 You can use white or a combination of white and black sesame seeds. Whatever you want. really bash them around until you make a good paste. 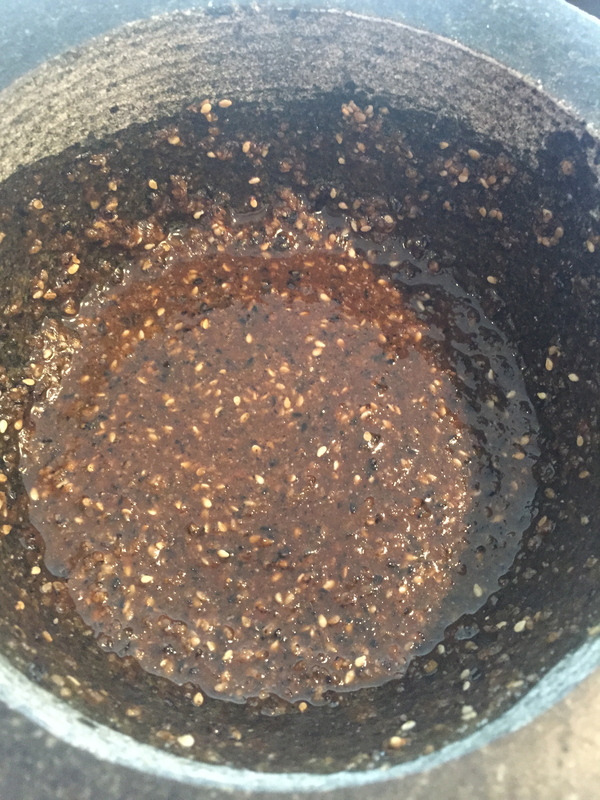 Next you will add your soy sauce, rice vinegar, sugar, sesame oil and continue to stir and bash around until it forms a nice dressing that is almost like a paste. Man it’s so good. add the rest of the ingredients and continue to bash around. 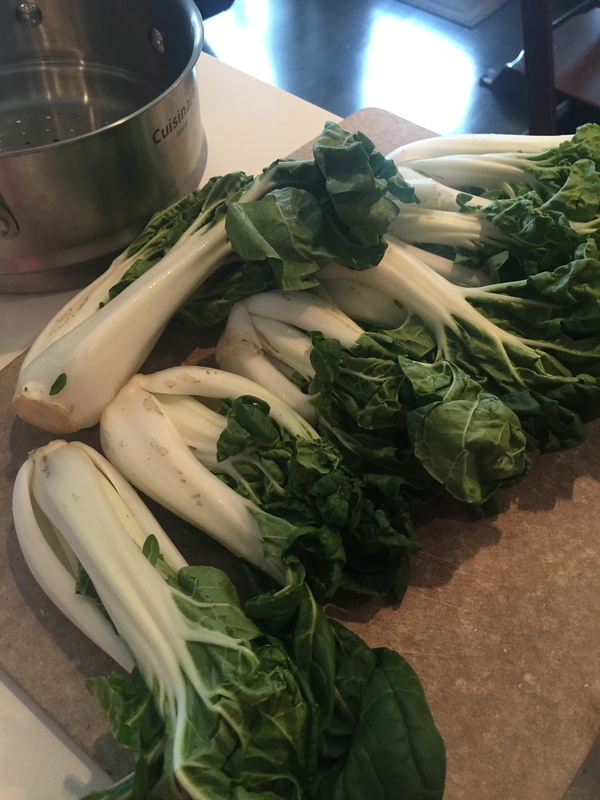 Now you want to steam your bok choy (or spinach if you want) for a minute or two until it’s nice and bright green and the stems are still crunchy. 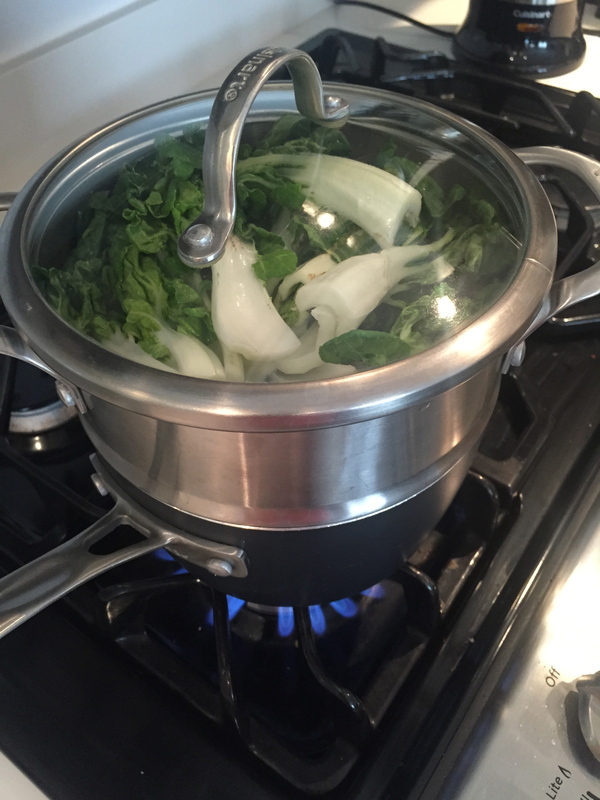 Once this is done, put the bok choy in a bowl with ice cold water. This will stop it from cooking and allow the lovely colour to remain. Once it has cooled, take it out of the water and squeeze all of the water out. Next you can start to spoon the dressing over top. Use as much or as little as you want. *Confession, I made this knowing I would have extra dressing and could use up some baby spinach tomorrow. Seriously so friggen good. Spoon some dressing over top. Now you are ready to serve this up as a delicious side or you can just eat a big massive bowl of it. I have taken this to work before because it’s such a great cold dish, it packs well and you can eat a lot of it without feeling like Boss Hog. 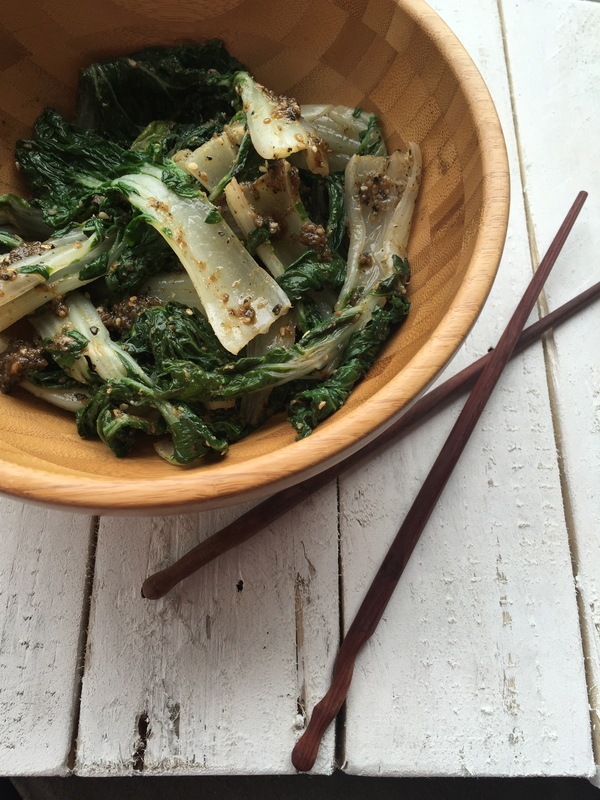 *I would recommend if you are taking it for lunch, you may want to pack the dressing separately as once it’s dressed, it does tend to draw out more water in the bok choy if you let it stand too long. 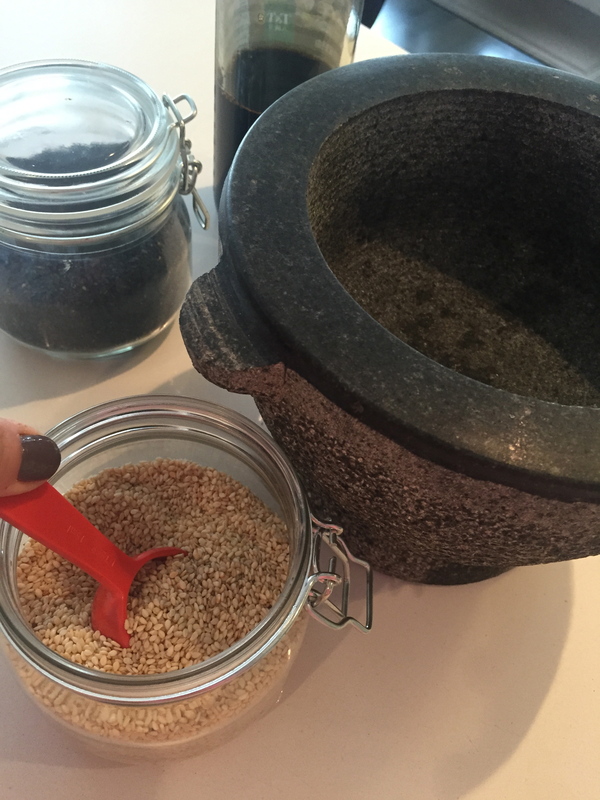 Using a mortar and pestle, pound 4 Tbsp of sesame seeds (keep the remaining 2 Tbsp for garnish) until you have almost a paste like consistency. Next, add remaining ingredients and mix around until you have a thick dressing like paste. 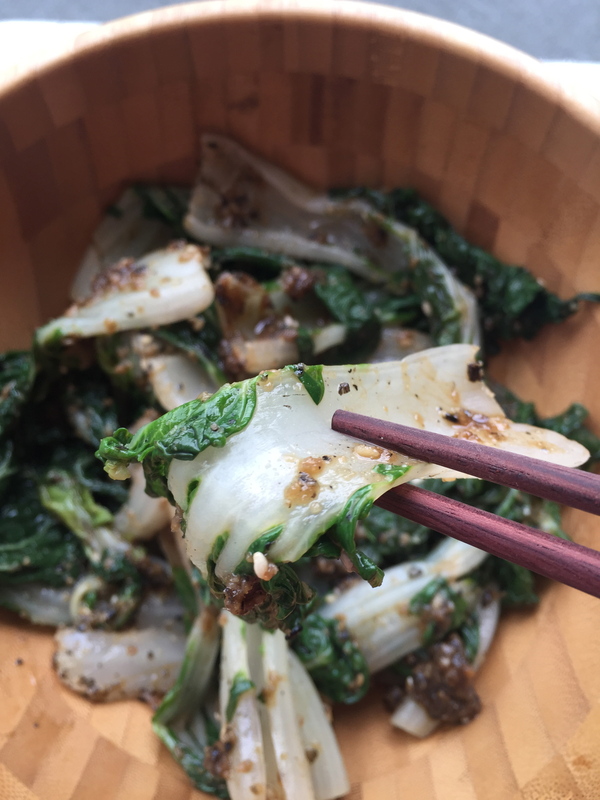 Dress the bok choy with the gomae dressing by spooning it over top.